This was the first image that greeted us on the way into the Portland Convention Center. 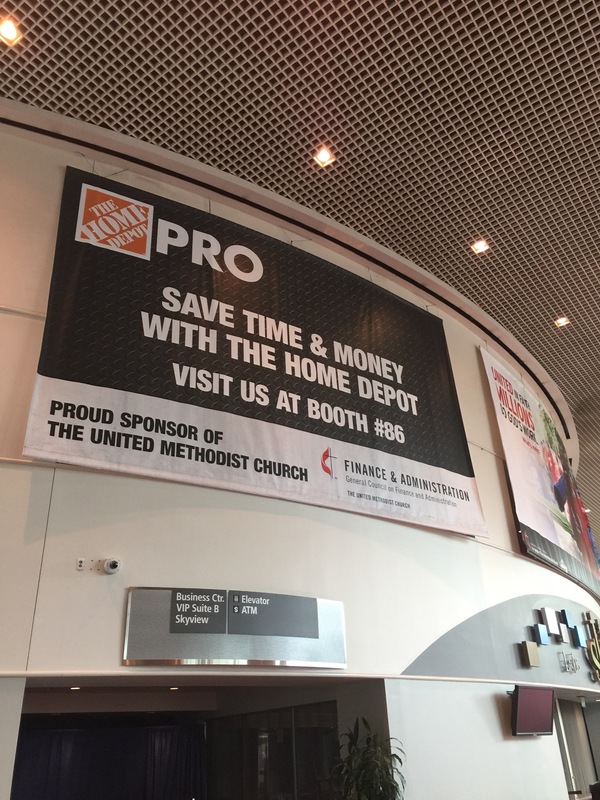 Don’t get me wrong, I’m thankful for The Home Depot for sponsoring the Wi-Fi but you can see around the corner the beginnings of a banner procliaming what we can do, United. The first Day of General Conference was slow–familiarize self with the Convention Center and Portland in general, read up on the mass transit system (so as not to look entirely like a tourist), and grab credentials. Beyond that, it was good to catch-up and see friends from across our global connection. Standing in the registration hall, it feels like a big homecoming. Hugs are shared, introductions are made, people whom your only prior connection has been social media are made in person, and you even geek out a little seeing some of the United Methodits who have great cache in the press and in social media. As you walked around and listened to folks, one of the more reoccurring statements made is that people are anxious. I do not sense the joyous anticipation that I saw in Tampa (reserve delegate) or Ft. Worth (marshal). That observation spans the various theological, age, regional, and political spectra. It could be all the posturing that the various caucus groups have done–social media, statements, informal pre-meetings, and the like. This morning, I pray that as we begin with our Opening Worship, the Spirit might move so that we might be renewed and catch a vision of what God wants to do through the United Methodist Church.